The first known prime found to exceed one million digits was discovered in 1999, and is a Mersenne prime of the form 26972593 1; it contains exactly 2,098,960 digits. Subsequently other Mersenne primes, of the form 2p 1, have been found which contain more digits. However, in 2004 there was found a massive non-Mersenne prime which contains 2,357,207 digits: 28433 27830457+1. This entry was posted in Euler, Ruby on 06/02/2013 by MantasCode. This entry was posted in Euler, Ruby on 06/01/2013 by MantasCode. The 5-digit number, 16807=75, is also a fifth power. Similarly, the 9-digit number, 134217728=89, is a ninth power. 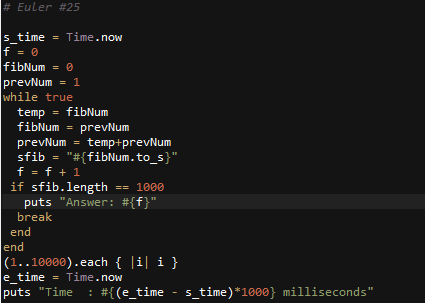 This entry was posted in Euler, Ruby on 05/30/2013 by MantasCode. In combinatorics, we use the notation, 5C3 = 10.
where r n, n! = n(n1)…321, and 0! = 1. How many, not necessarily distinct, values of nCr, for 1 n 100, are greater than one-million? 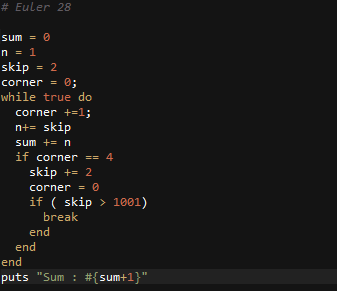 This entry was posted in Euler, Ruby on 05/29/2013 by MantasCode. Considering natural numbers of the form, ab, where a, b 100, what is the maximum digital sum? 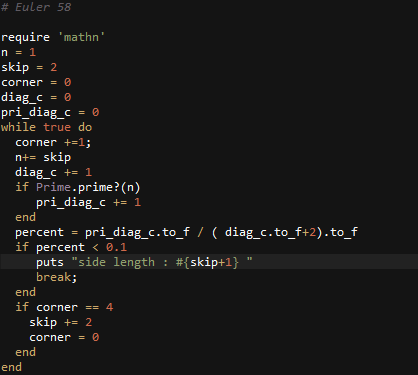 This entry was posted in Euler, Ruby on 05/26/2013 by MantasCode. The series, 11 + 22 + 33 + … + 1010 = 10405071317. 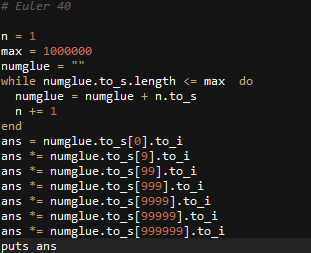 Find the last ten digits of the series, 11 + 22 + 33 + … + 10001000. This entry was posted in Euler, Ruby on 05/25/2013 by MantasCode. Recently, I’ve been typing more Ruby then usual. 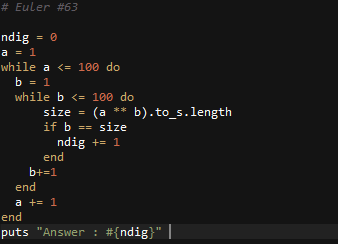 In Ruby you can have a fairly big number. Fn = Fn 1 + Fn 2, where F1 = 1 and F2 = 1.
n² + an + b, where |a| < 1000 and |b| < 1000 where |n| is the modulus/absolute value of n e.g. 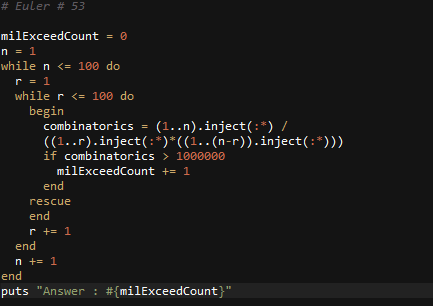 |11| = 11 and |-4| = 4 Find the product of the coefficients, a and b, for the quadratic expression that produces the maximum number of primes for consecutive values of n, starting with n = 0. 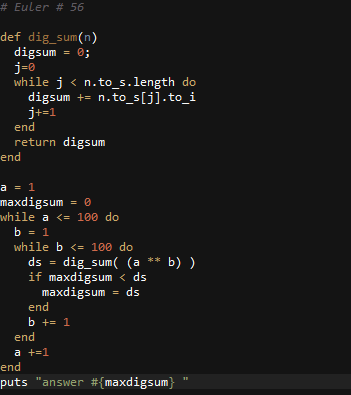 This entry was posted in C#, Euler on 11/29/2012 by MantasCode.